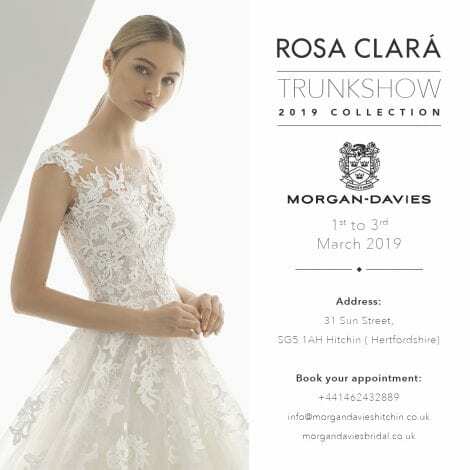 Morgan Davies Bridal will be hosting a two-day designer event for the 2019 Rosa Clara collection at their flagship Hertfordshire boutique at the beginning of March. There will be the opportunity to see a large selection from this beautiful collection for just two days. Rosa Clara is one of Europe’s most respected designers, with her dresses worn by many celebrity brides. Now Hertfordshire brides-to-be can get to see just why Spanish designer Rosa Clara has established itself as one of the most exciting talents in bridal couture over the past 20 years. Brides-to-be will see the signature Rosa Clara style presented in one of the most sensual ways to date for 2019. This collection accentuates the female silhouette through delicate fabrics and exquisite beading whilst staying true to the feel of pure romance that come with every Rosa Clara design. For brides looking to make an impression and stand out, this new collection is for you. Every bride who orders her dress during the trunk show will receive an accessory voucher worth £150 and a 5% discount on their chosen dress. Long known for bringing some of the bridal industry’s biggest names to the region, Morgan Davies Bridal’s latest event is expected to be very popular. So, to avoid disappointment, customers are advised to book their appointment early.